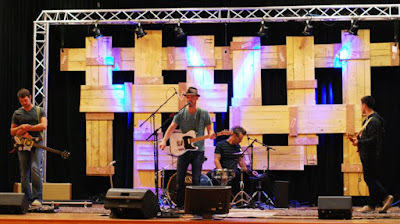 Ridge Church kicked off a brand new series yesterday called "On your Mark". You can catch part one of the series HERE. The truth is, every single one of us could walk into church any given Sunday and find ourselves mentally arguing with what the pastor says. We think "Yeah...but" and "What about..." or "If he only knew my story..." and we come up with all sorts of reasons why something that might be slightly challenging doesn't actually apply to us. 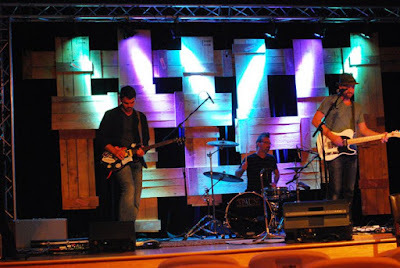 BUT--over the years I've been in ministry the one thing that is "SIMPLY UNDENIABLE" is life change. When a person is literally changed by the grace of God people may not understand it but they can't deny it. Check out this story and Baptism from our service on Sunday. El's Baptism from Ridge Church on Vimeo. I'm a big fan of Miles McPherson, pastor of "The Rock" in California. He has adopted a mantra and simple challenge for his church "JUST DO SOMETHING" (He framed it as a book as well "Just Do Something"). My brother is the Chief Editor of "Outcomes" magazine and you can read his interview with Miles on this mantra "Just Do Something" HERE. The reality is this: Most of the great and extraordinary things that happen in this world happen under the initiative or authority of people that weren't experts when they started whatever it was that they started. Sometimes the answer to change is to "JUST DO SOMETHING"
That is our challenge to Ridge Church! It's time to do something (AGAIN). 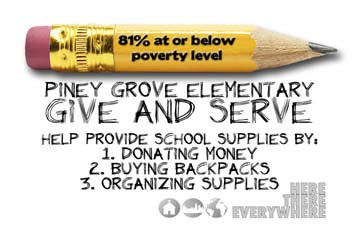 We are partnering with a local title one (81% free and reduced lunches) school called Piney Grove Elementary. We've set an audacious goal of providing 600 filled back packs for children as they start back to school. This is just one of many initiatives at Piney Grove over the next year. BACK PACK ORGANIZATION DAY: We have our first organization day Monday, August 15th 6-8pm at New Charlotte Church. Map HERE. Email melissar@ridgechurch.net to confirm your attendance. Lemonade and cookies provided. 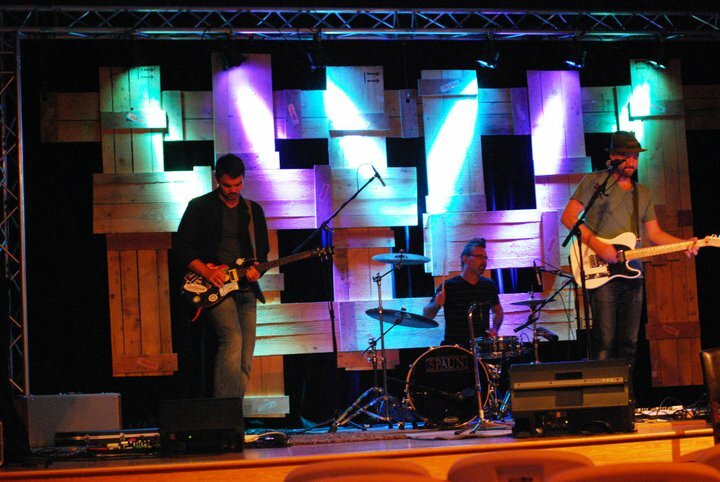 Back in 2006, following an undeniable passion God had placed in my heart, I began talking with a handful of people about the idea of starting a church in Charlotte that would create environments that un-churched people would love to attend and a church that prioritized authentic community among believers. By the end of 2006 through a series of what we called "Core Gatherings" we had rallied about 30 adults to join us in this effort and we had officially named the church "RIDGE CHURCH" . Fast forward to 2007...North Point Community Church founded and led by Andy Stanley contacted me and extended their hand to us to form a formal partnership. Our team launched a series of 25 evening worship services in 2007 and then FINALLY in 2008 (in the worst economic downturn of our lifetime:-) we held our very first Sunday morning worship service and the official journey began. We have seen and experienced unbelievable life change during this journey. 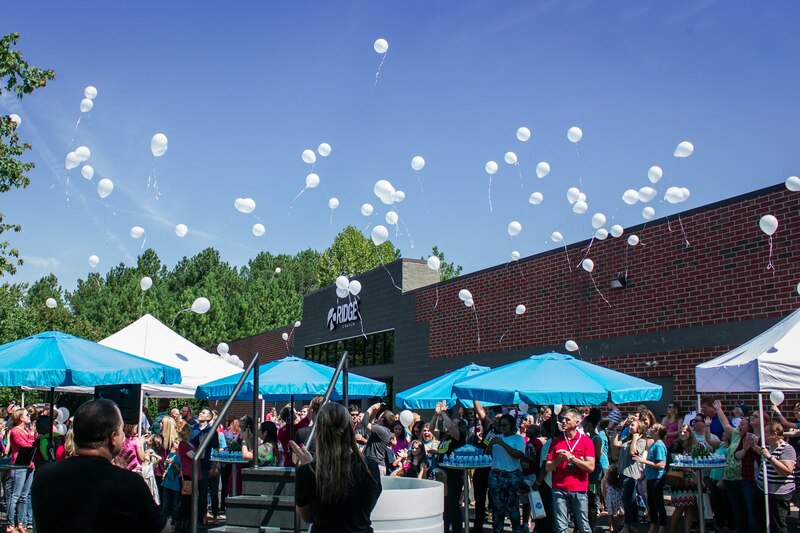 NOW: We are excited to welcome Andy Stanley to come speak at Ridge Church in Charlotte on September 15th to celebrate with us--both what God has done and what is yet to come for Ridge Church. We hope you'll join us for this event! Space is limited. You can register online HERE. We are in a really great series at Ridge Church that is incredibly timely in light of the economic turmoil and fear our country has been experiencing in the last few weeks. The stock market is going crazy, the country's credit crisis has caused a frenzy and people are wondering if 2011 is going to close out like a bad replay of 2008. 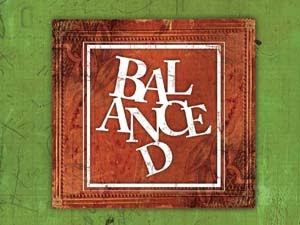 So...our series called "Balanced" couldn't be more perfectly timed. Join us this Sunday as we continue to answer the question "How can we stay in financial balance personally when it seems like the entire world around us is out of balance?" You can listen to last week's message by clicking HERE.